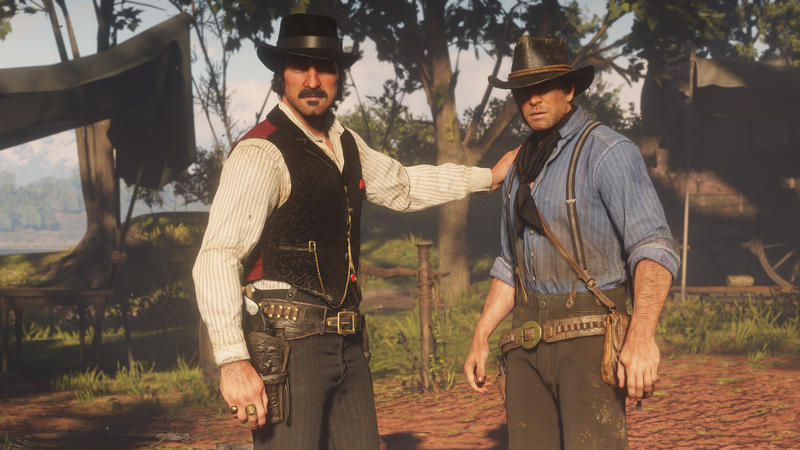 Digital Foundry’s latest report compares and contrasts all the consoles to reveal the best place to play Red Dead Redemption 2, in terms of graphics. While the PlayStation 4 Pro runs the game beautifully, it’s outperformed by the Xbox One X. But this gap is much smaller than the one Digital Foundry saw in last gen’s Red Dead Redemption. Environments are equally as lush on all platforms, rendering effects are almost a complete match, while draw distances and pop-in are just as solid regardless of the machine you play it on. It’s in the details where you’ll spot the differences. This is “tied to rendering resolution” and varies between each console. At the top of the stack sits Xbox One X, rendering natively on ultra HD displays and looking magnificent. Taking the runner-up position here is PlayStation 4 Pro, which uses a reconstruction technique – likely checkerboarding – to take a native 1920×2160 framebuffer up to 4K. If you don’t have the highest tier of console your best bet for graphical fidelity is the PS4, compared to the Xbox One S.
As expected, pixel-counts on PlayStation 4 resolve at the de facto standard 1080p, while the Xbox One S – quantifiably the lowest quality experience – delivers just 864p. In short, if you want the best visuals and highest level of performance the order of consoles ranks as follows Xbox One X, PS4 Pro, PS4, and lastly Xbox One S.